On Saturday, December 3, the Yellowstone in Winter team met at the NC Museum of Natural Sciences in Raleigh to get to know one another, learn about Yellowstone, and discuss the details of our upcoming trip. We found we shared similar hopes and concerns. Everyone was excited to experience Yellowstone in Winter, to see amazing wildlife and thermal features, and to bring that experience back to their students. The concern that loomed largest was how to keep warm in the chilly winter weather. We presented a slide show to highlight some of the sites and scenes of Yellowstone including ice-covered bison, billowing steam, and frosty tree branches. And we talked about the trip’s itinerary. We’ll spend our first few days in the north end of the park observing wildlife and snowshoeing. Then we’ll hop on a snowcoach (basically a small bus on treads) that will take us over the snow-covered roads to Old Faithful, where we’ll experience the magic of a geyser basin in winter. After a night in the Snow Lodge, we’ll return to Mammoth to wrap up our time in the park. We finished the afternoon off with a fun activity to get used to snowshoeing and learn a few Yellowstone facts. Each team member created a pair of cardboard snowshoes – cut out about the same shape and size as a real showshoe. We duct-taped them to our feet – one piece running over the toes and another wrapping from the front of the snowshoe back around the heel of our shoes. When everyone was snow-shoed, we had a relay race that included matching facts to the creature or feature they referred to. For instance, to whom does this refer? “I am the largest geyser in the world. 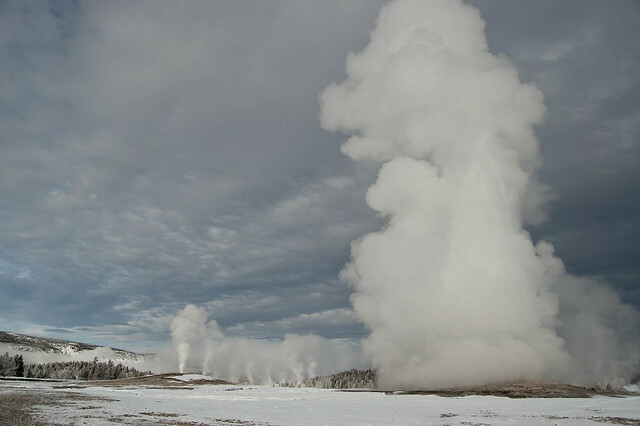 When I erupt I send jets of water nearly 380 feet high in a spectacular display.” A snowshoe-clad teacher would have to dash up to the board and match that fact correctly with “Steamboat Geyser,” then race back to her team. It was a fun way to finish the day. We’re all looking forward to the start of our adventure on January 11! Follow along as we report the highlights of our trip on this blog! This is a wonderfull opportunity for classroom teachers. We are very excited that one of our teachers, Andi Webb, is able to particpate in this exciting adventure. We are looking forward to following her blog! It looks like you are having a GRAND adventure. Will be sharing this with the class tomorrow during Social Studies…showing them how S.S. comes to life. Thanks for sharing and be safe. We look forward to hearing all about this wonderful trip! Thinking of you! Linda and class! Linda~So excited you’re sharing! It is a great way to teach science and social studies. I’ll share my pictures b/c there are excellent landforms that we saw. To everyone on the trip~Ahhhhhh, Colby!!! 🙂 Thanks for including that! My kids are loving the blog!